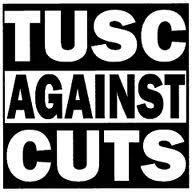 Swansea Trade Unionist and Socialist Coalition (TUSC): Swansea Council Elections: No Cuts! Swansea Council Elections: No Cuts! Council elections take place across Wales on May 3 and present an opportunity for anti-cuts campaigners to say "this economic crisis is not of our making and we will not be made to pay for it", by opposing all cuts. This Conservative/Liberal Democrat government is destroying many of the services that so many of us rely on - Council Services/The NHS/Welfare benefits. Unfortunately, the cuts are being passed on by Councils of all shades of political opinion and by a Labour Welsh Government in Cardiff. It is important to challenge the consensus of all the mainstream parties that cuts are necessary. If we don't do this then the only debate in this election will be in what way will living standards in working class communities destroyed. The Trade Unionist and Socialist Coalition (TUSC) is not prepared to see this happen. We are a grouping of socialists, trade unionists and anti-cuts campaigners who have agreed on a common no-cuts platform. There will be TUSC candidates standing in the council elections in Wales. If, like us, you are not prepared to see working class people pay for this crisis, then support the alternative. Oppose all cuts to council jobs, services, pay and conditions - we reject the claim that 'some cuts' are necessary to our services. Use all the legal powers available to councils, including powers to refer local NHS decisions, initiate referenda and organise public commissions and consultations, to oppose both the cuts and government polices which centrally impose the transfer of public services to private bodies. When faced with government cuts to council funding, councils should refuse to implement the cuts. We will support councils which in the first instance use their reserves and prudential borrowing powers to avoid passing them on - while arguing that the best way to mobilise the mass campaign that is necessary to defeat the cuts is to set a budget that meets the needs of the local community and demands that the government makes up the shortfall. Councillors make us sick celebrating cuts! Who says strikes are ineffective? TUSC candidates - the best money can't buy!